Virto Media Player video files of .flv, .m4v formats. 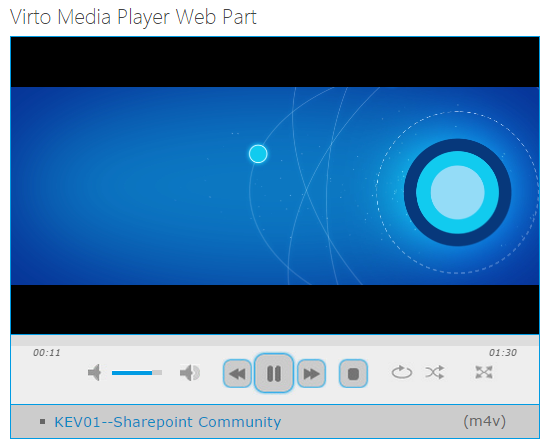 When the web part is adjusted, you can use it on your SharePoint site page. You can use the following buttons to manage player. Use volume control to adjust volume. Standard order buttons are used to navigate to required item of your playlist. You can replay playlist if you use replay button. Shuffle option of also available in the player. Switch to full screen mode, if you need. Use delete buttons to remove items from playlist. Links to content are opposite items in playlist. Playing audio looks similar though the upper control is hidden. Virto Media Player support audio files of .mp3 and .m4a types.